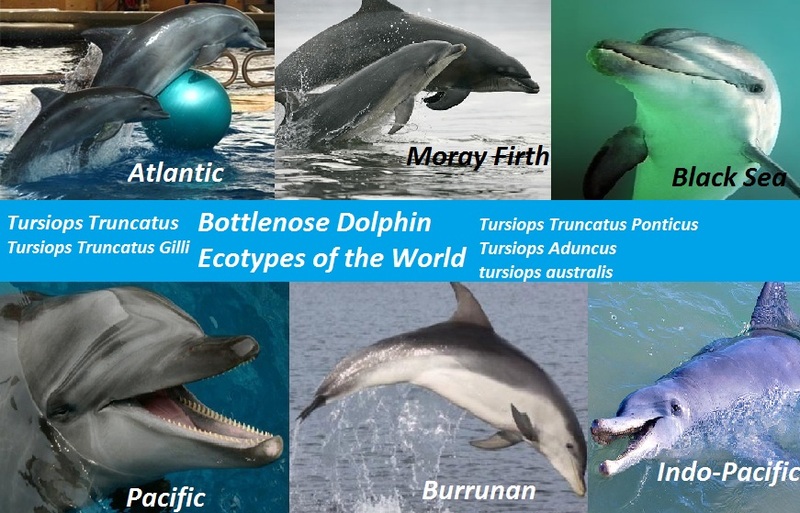 There are six different eco-types of bottlenose dolphin that can be found all over the world. Two of these forms (Eastern Atlantic and the Moray Firth, also known as the North Sea bottlenose) can be found in the Atlantic Ocean. The Pacific bottlenose dolphin can be found in all temperate, tropical and sub-tropical regions of the Pacific Ocean while it's Indo-Pacific counterpart can only be found in the Southern Hemisphere. The two other types mentioned in this image are the Burrunan (found only in Australian waters) and the Black sea bottlenose dolphin, which is only found exclusively in the Mediterranean and Black Seas. The common bottlenose dolphin (Tursiops Truncatus) is probably one of the most celebrated species of dolphin. Over the centuries, they have been a subject to both Greek and Roman mythology as a life saver to lost ships and sailors at sea. 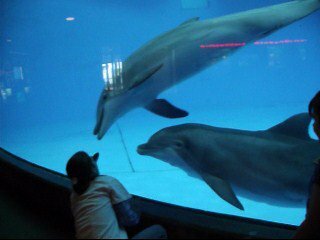 Today, they have become well known in TV shows such as Flipper and their common presences in a number of marine zoological parks around the world. Only recently has the common bottlenose dolphin has been classified as a separate species from the Indo-Pacific bottlenose dolphin of the southern hemisphere. However, a new species, the Burrunan bottlenose dolphin, only found in waters off Australia, has been classified as a new species of bottlenose dolphin. This is what a bottlenose dolphin looks like. Like many other species of oceanic dolphins, bottlenose dolphins have wide heads, bodies, short stubby beaks, long flippers, a moderately tail, and falcate dorsal fin. They also have marked creases between the melon and the beak. Yet, researchers have been able to prove that there are a wide variability within the species. For example, inshore and offshore bottlenose dolphins have been found to be quite different when it comes to their morphology and it has been proved that offshore animals tend to larger, have smaller flippers, and be darker than their inshore counterparts. However, both forms do see the males tending to be larger than heir female counter parts in length, girth, and mass. Bottlenose dolphins have large cone-shaped teeth that are made to help them catch and sallow their prey hole. The upper jaw has 20-26 pairs while the lower jaw has 18 to 24 pairs. As for the skin coloration, the color patterns consists of grey tones with strong counter-shading that is usually dark dorsally and light ventrally but no sharp demarcation between the elements. There’s a dark dorsal cape that begins at the melon’s apex that extends back past the dorsal fin. They also have a light blaze that may sometimes cover the sides and flans while the belly may remain either off-white, pink, or light grey. There is also a muted eye-to-flipper stripe too. While the flippers, flukes and dorsal fin are either dark or medium grey, the dolphins also display tooth rakes that were caused by the teeth of other dolphins on their bodies. Lifespan: The average is mainly around 25-35 years but some captive animals have been known to live between 40-50 years. Conservation Status: Least Concern, but some populations are threatened due to habitat loss, fishery conflicts, pollution, and over hunting. Bottlenose dolphins can be found in all tropical and temperate oceanic habitats in the world. Bottlenose dolphins can be found in tropical and temperate oceans worldwide. Because they occupy a wide variety of habitats, bottlenose dolphins are considered to be one of the most adaptable cetacean. There are even coastal populations along the continents and around most oceanic islands and atolls. However, these animals are more common in bays, estuaries, and the lower reaches of rivers. In addition, there are pelagic offshore populations centered far offshore such as in the Gulf Stream of the North Atlantic and the Eastern Tropical Pacific. Overall, bottlenose dolphins are mainly found where water surface temperatures are in the range of 45 to 90 degrees F. While Atlantic populations may have a seasonal migration between New Jersey and North Carolina, California populations often migrate into the Baja during the winter months. 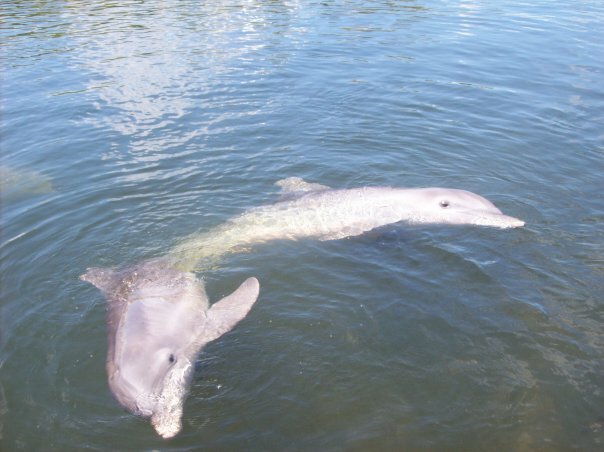 bottlenose dolphins like Dolphin Research Center's Jax and Gypsi are among the most social animals in the animal kingdom. Bottlenose dolphins are social animals who live in pods that vary greatly in size depending partly on the habitat. Animals that live in the bays often form smaller pods of 2 to 15 members than those offshore who would often form pods that range into tens or hundreds of dolphins. However,Ba composition and stability of these groups would also vary as well. Bands of related females may stay together for many years, during which time they are visited briefly and occasionally by adult males. Pair bonds between males have been documented to last anywhere from 20 years or even longer. The Dolphins often associate with other cetacean species such as false killer whales and pilot whales. The bottlenose is also well known to bow ride and approach vessels. They also surf in waves of any kind ranging from those made by small boats to those made by large storms. Researchers have studied dolphin communication and it's secrets for decades. While it is not known if bottlenose dolphins have a formal language of their own. However, they do communicate with signature whistles to identify both themselves and other dolphins. Because dolphins lack vocal cords, they use their sphincter muscles within their blow holes to produce a complicated system of whistles, clicks, squeaks, moans, and trills. Bottlenose dolphins, like all other toothed whale species, are known to use echolocation (sonar) to send out frequencies by clicking. These clicking sounds then bounce off objects before returning sound waves that are picked up by the dolphin’s forehead and lower jaw and interpreted as to distance, size, and shape of object. This unique sound system is useful at night and to navigate in murky waters even if the dolphin’s visibility is poor. Overall, bottlenose dolphins have been known to produce sound frequencies from 0.25 to 200 Khk, using the higher frequencies for echolocation, and the lower frequencies for communications and orientation. Dolphin catch and sallow their prey whole and they do not chew it up. Bottlenose dolphins prey on a large variety of organisms, depending on the habitat. Animals who live in coastal regions tend to feed on fish and invertebrates that live on or near the bottom. Offshore dolphins tend feed on pelagic fish and squid. Bottlenose dolphins may forage individually and cooperatively. They are well known for catching their prey by fish whacking, or the method of striking a fish with the flukes and knocking it clear of the water. They have also been observed driving schools of fish onto mudflats and partially beaching themselves to collect the fish. 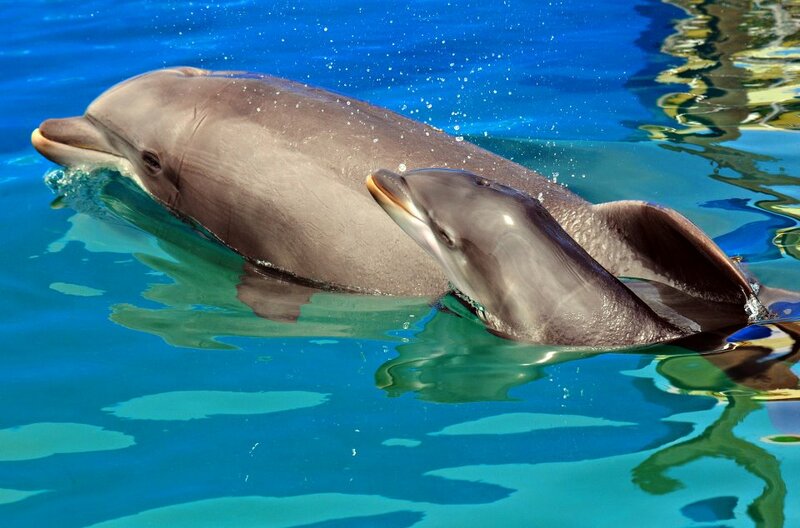 During the first few years of life, bottlenose dolphin calves learn the ways of dolphin life from their mothers. While female bottlenose dolphins sexually mature at around 5-8 years of age, it may be another 7-10 years before they have their first calf. Males usually sexually mature at around 8-12 years of age. During breeding, a single female may breed with multiple male partners in very short sequences in one season. This can make determining the sires of calves very difficult by researchers who study dolphins in both a wild and captive environment. The gestation period for the bottlenose dolphin is around 11-12 months. Although calves can be born anytime of the year, births during the winter months is very rare. While dolphin calves are weaned at around 18-20 months old, they may remain associated with their mothers for several more years. A female bottlenose dolphin may produce a single calf every three years. About 35% of all dolphin calves die during their first year. Although bottlenose dolphins are not endangered, they still face many threats out in the wild. While the bottlenose dolphin is not endangered, some populations still at risk of dying out because of pollution, habitat loss, fishery conflicts, and over hunting. For example, large numbers have been killed in fisheries in the Eastern and Western United States until the Marine Mammal Protection Act took into effect in 1972. However, this was not the same for dolphin populations in the Black Sea which did not receive protection until the 80’s and 90’s and yet, this population remains depleted to this day. In the United States Atlantic Coast and the Gulf of Mexico, major die-offs of bottlenose dolphins have been linked to oil spills, viral outbreaks, and exposures to toxins. Researchers believe that the heavy burdens of pollutants in their bodies have weakened their immune systems. Meanwhile in the Mediterranean Sea, pollution, loss of food source, gillnet entanglements have been viewed are serious threats to local populations. In some places like Japan, they are harpooned and killed for meat, bait, and pest control.